A flange nut is a nut that has a wide flange at one end that acts as an integrated, non-spinning washer.This serves to distribute the pressure of the nut over the part being secured, reducing the chance of damage to the part and making it less likely to loosen as a result of an uneven fastening surface. 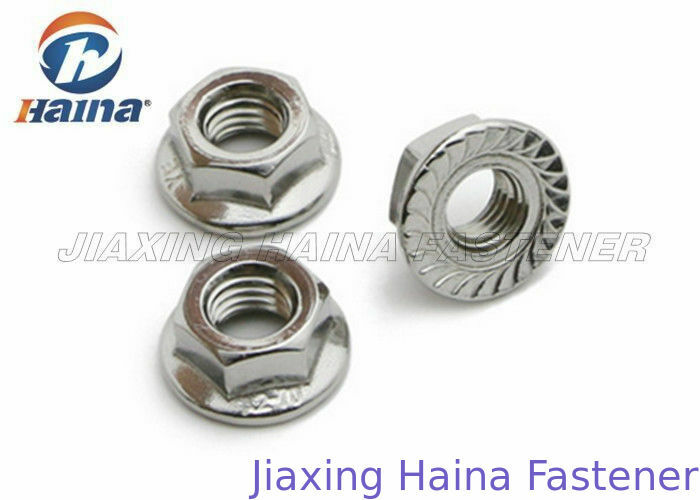 These nuts are mostly hexagonal in shape and are made up of hardened steel and often coated with zinc. The flange may be serrated to provide a locking action. The serrations are angled such that they keep the nut from rotating in the direction that would loosen the nut. Because of the serrations they cannot be used with a washer or on surfaces that must not be scratched. 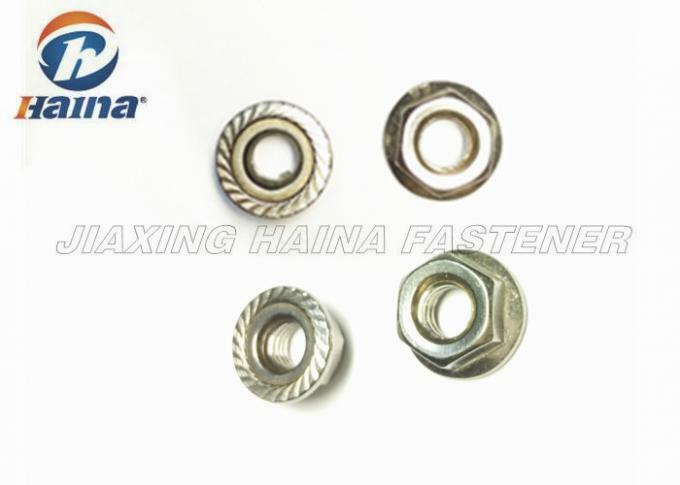 The serrations help in preventing the vibration of the nut from moving the fastener, thus maintaining the holding power of nut. The flange nuts are sometimes provided with a swivel flange which helps in creating a more stable structure without affecting finished product like a serrated flange nut. Swivel flange nuts are mostly used in joining wood and plastic. Sometimes both faces of the nut are serrated, permitting either side to lock. The flange nuts are available in most common metal types including brass, stainless steel and titanium. Course and fine thread nuts are also available in the flanged design, making the fastener a viable option for most fastening requirements. 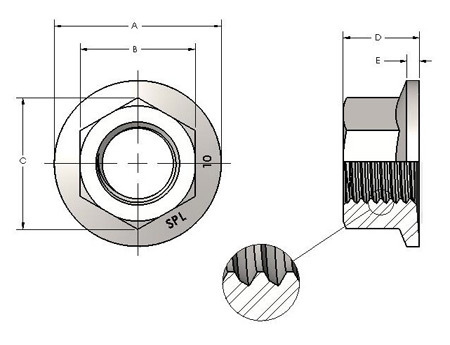 The serrated bottom of the locking flange nut design is a popular choice with electronics fasteners. The serrated flange bites and holds electrical fasteners in place. When used on a fragile surface, such as aluminum, the flanged nut is much less prone to damaging the soft metal surface than a traditional nut. Another popular reason for using a hex flange nut is the ability to place the nut into a socket wrench and then reach into hard-to-access areas without dropping the nut. The flange sits tightly against the edge of the socket wrench and prohibits the nut from sinking deeply into the socket. The socket can be used as an extension of the user's arm in order to start the nut onto the bolt. Combined with a magnetic socket wrench, a hex flange nut is nearly impossible to drop out of a socket wrench.